Concord, North Carolina (August 31, 2017) – Tom Hessert makes his return to the ARCA Racing Series presented by Menards looking for a repeat win of last season’s dominating dirt performance in Monday’s General Tire GRABBER 100 at the DuQuoin State Fairgrounds ‘Magic Mile’. Hessert, a six-time ARCA Racing Series presented by Menards winner, will be back behind the wheel of his No.25 Musselman’s BIG CUP Apple Sauce Toyota ready to defend his title. 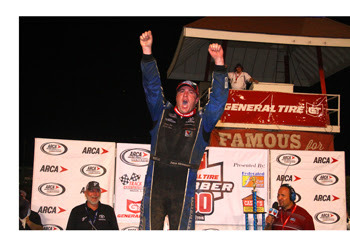 In seventeen previous dirt track starts Hessert has put together an impressive record. Highlighted with his win at DuQuoin last season, Hessert has finished in the top-5 in half of all dirt races – including an impressive seven finishes in the top-3. 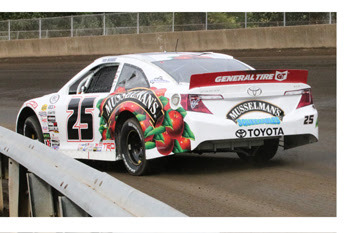 Finishing second in last season’s Championship Point Standings, Hessert will make just his fourth start of the season. Hessert will finish his abbreviated ’17 ARCA schedule driving his Musselman’s BIG CUP Apple Sauce Toyota Camry at Salem Speedway on September 9. The 64th running of the General Tire GRABBER-Southern Illinois 100 is scheduled to get the green flag at approximately 3 p.m. local Central time. Practice is from 10:45-11:45 a.m., with General Tire Pole Qualifying at 12:30 p.m.
ARCAracing.com will feature live audio coverage of all on-track activities including flag-to-flag coverage of the General Tire GRABBER-Southern Illinois 100. Live timing and scoring of all on-track activities and live chat will also be available throughout the afternoon at arcaracing.com. The race will air on MAVTV at a later date. A family tradition, deeply rooted in quality. Musselman’s BIG CUP satisfies appetites of teens and adults with active lifestyles, while Musselman’s Squeezables is the healthy snack Mom can provide to her children who are on-the-go. Musselman’s was founded in Biglerville, PA, in 1907 by Christian and Emma Musselman. The original plants in Biglerville and Gardners, PA, provided much needed canned goods for the servicemen during WWI including corn, tomatoes, and of course apples. They focused on the processing of the abundant local fruit in the area, producing apple sauce, apple juice, and their now-famous Musselman’s Apple Butter. In 1984 the C. H. Musselman Company was purchased by a cooperative of local fruit growers (Knouse Foods, Inc.). The Musselman’s name, which reflects quality, tradition and value was preserved and remains a thriving brand today under the ownership of the growers who still tend to their fruit orchards. Knouse Foods, Inc., established as a growers’ co-op in 1949, has a long history of providing outstanding fruit products. They believe making healthy, delicious fruit products is more than just a job; it’s a way of life. And that’s why the growers who have spent their entire lives nurturing their orchards and harvesting their fruit also own the company. That pride and care are the key ingredients that make Knouse fruit products the very best. For more information visit www.Musselmans.com. Venturini Motorsports (VMS), fielding cars for over 30-years in the ARCA Racing Series presented by Menards, is one of the premier NASCAR driver development programs in the country. Multiple team championships and consistent on-track success, VMS has evolved into one of the most recognizable names in motorsports. Since 2007, VMS has assisted in the career development of notable NASCAR drivers such as Joey Logano, Erik Jones, William Byron, Justin Allgaier, Alex Bowman, Christopher Bell, Noah Gragson, Ryan Blaney, Brennan Poole, Daniel Suarez, and Brandon Jones. Over the years the Venturini name has become synonymous with modern-day racing in America. In 2012, the Venturini family was inducted into the National Italian American Sports Hall of Fame and now find themselves enshrined with such sports icons as Joe DiMaggio, Mario Andretti, Vince Lombardi, Tommy Lasorda and Rocky Marciano.